In nature, cows and their ancestors produced milk for one reason – to nourish their offspring. While there are many important factors in a calf’s development, nothing is more vital than milk. As with all mammals, cow milk contains a unique assortment and proportion of nutrients customized specifically for a calf’s initial survival and proper growth. Only when a cow is allowed to live a natural life can the animal’s true nature be observed. After nine months of gestation, the cow leaves the herd in search of a secluded location to give birth. In the minutes after birth, the bond between a cow and her calf is undeniably strong. From this day forward, her time and energy are devoted almost exclusively to protecting and nurturing her calf. Capable of living 25 years, cows form strong emotional bonds with their offspring as well as other members of the herd. Some of these bonds are easy to recognize while others are more subtle and complex. 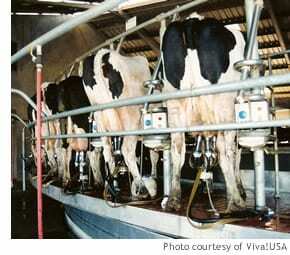 In industrial animal factories, cows are thoroughly exploited for their milk. Instinctual needs and desires have been manipulated and suppressed to maximize milk production for human consumption. In order to consistently produce milk, cows must be repeatedly impregnated. The pregnancies are initiated by artificial insemination, and after nine months of gestation, a calf is born. Within a day of birth (sometimes hours) the calf is taken away from his or her mother, never to be reunited. Both the mother and her calf are extremely traumatized by the separation and have been known to cry out for each other for hours, days or even weeks after being forced apart. Some video footage shows the mother and her offspring frantically fighting to be together. The female calves are raised for milk production. At a time when they should be nourished by their mother’s milk, the infant calves are isolated in individual crates. After several weeks they are moved to small groups where each calf has as little as 35 square feet (6’x6′). Throughout their adolescence they are fed a milk replacement-their mother’s milk is far more valuable as a human commodity. Over the past several decades, milk production has become highly mechanized and scientifically refined. Annual milk production per cow has risen from 2.3 tons in 1940 to 11.4 tons in 2016. [4,5] This staggering increase is due to several factors, including selective breeding, high-protein feed, mechanized milking and the more recent trend of injecting the cows with rBST, also known as bovine growth hormones (BGH). Due to potential impacts on human health, these synthetic hormones were banned in the European Union and Canada in 1999. The most “cost-effective” way to extract such an unnatural volume of milk is for the cows to be milked by machines multiple times a day over a 10-12 month period. The method and frequency of milking commonly causes teat lesions that leave the cows at an increased risk for mastitis (painful inflammation of the mammary gland). After being forced to produce unnatural quantities of milk for 2-4 years straight, their rate of production begins to decline. No longer valuable to the milk industry, they are slaughtered and processed into lean ground beef used mostly for hamburgers. Each year in the U.S. alone, over 9 million cows are milked to the point of exhaustion. The process of transporting cattle from a feedlot to a slaughterhouse is extremely stressful. Like all animals, cows have an innate fear of unfamiliar surroundings. Current laws allow transporters to travel up to 28 consecutive hours without a rest period. The 28-hour period can be extended to 36 hours by simply submitting a written request. During this time, the animals are deprived of food and water, and vomiting and diarrhea are common due to hours of vibration and maneuvering. When they arrive at the slaughterhouse, they pass through a chute that starts out wide, then narrows. Each individual is placed in a “stunning box” designed to restrain the animal so he/she can be stunned. The goal is to penetrate the brain but not sever the brain stem. If the brain stem were severed, then the heart would stop pumping blood and the animal would not bleed out as quickly or completely as desired. The tool most commonly used for this procedure is a captive bolt pistol. The pistol is placed firmly against the animal’s forehead and fired. A pointed bolt penetrates the brain causing the animal to spasm uncontrollably, and then collapse. After being shackled by a hind leg and raised off the ground, the cow’s throat is cut, and an incision is made from the neck to the abdomen. During the bleeding process many cows regain some degree of consciousness. Workers must be cautious not to stand too close as the struggling animals flail their limbs. Each year, a startling number of U.S. cows used for dairy production arrive at the slaughterhouse too sick, injured or weak to even stand. Referred to as “downers,” they are either euthanized or left alone to die. Until recently, these cows were commonly pushed or dragged into the slaughterhouses using chains or forklifts. 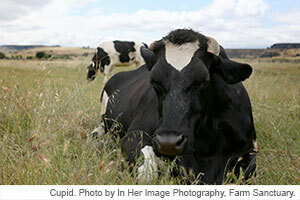 According to the USDA, 23,000 dairy operations reported downer cows in 2004. Like all other farmed animals, cows are not protected under the federal Animal Welfare Act. Industrial animal factories have strategically converted a life-giving fluid into a product that symbolizes exploitation. Despite the fact that 30% of people in the U.S. and nearly 75% of the world population are lactose intolerant, the industry continues to tout the “health” benefits of their product. [11,12] Meanwhile, millions of cows endure a life of confinement, physical exhaustion, separation anxiety and a collective indifference to suffering. As with all animals raised for food, our choice to go vegan can make a difference and ultimately prevent their physical and emotional suffering.